To most people Dianella amoena would be considered an obscure indigenous plant. It’s hardy and easy to grow so why would it become listed as endangered? Unfortunately Dianella amoena, or the Matted Flax Lily as it is commonly known has a relatively small range which unfortunately lies within the path of human development. Dianella receptor site 3 was one of the sites chosen for the translocation of Matted Flax Lily growing in the path of the new rail extension to South Morang, a suburb on the northern fringe of Melbourne. Dianella amoena is listed as endangered under the EPBC act. Dianella receptor site 3 is situated on Parks Victoria land, and we were told that only about 20 years ago the site used to be weed-free and had a diverse understorey of grasses and wildflowers. My first visit to this 2 Ha site was in early June 2010 just before the big drought broke. Its boundary was un-fenced; it was dominated by all sorts of weeds and grazed heavily by kangaroos and rabbits. I was conducting an assessment to prepare a quote to rehabilitate this site, as weeds had replaced more than 90% of the indigenous vegetation. In January 2014 we got the opportunity to demonstrate our vision. By the time we started work a kangaroo and rabbit proof fence had been constructed around the site. Figure 1. Weeds like Chilean Needle Grass, Yorkshire Fog Grass and Phalaris dominated the site back in 2013. The plan was to aggressively control weeds, retain all remnant vegetation and replace weedy areas with native grass. Our philosophy regarding weed control is to go in hard with all guns blazing. We use every technique we can to reduce weed propagules in the fastest way possible, especially when preparing to sow native grass seed. Our best preparation option for this site was to spray and cultivate selected areas and use other specialist weed control techniques across the site. The revegetation plan divided the site into zones of different management so the crews had specific instructions and could be more focused on small areas. Our aim in these situations is to stop all weeds from setting seed from the time we start site prep until we sow, then follow up with more weed control while maintaining the site. Figure 2. The site divided into separate management zones. 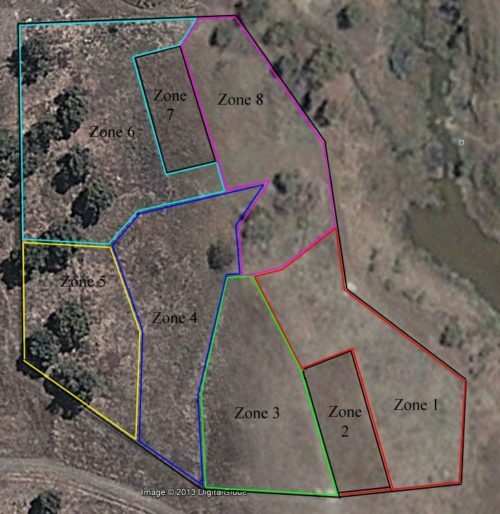 Zones 2 and 7 are the original Dianella amoena exclusion plots. Most of the translocated Dianella amoena were originally in small rabbit exclusion plots and were to be managed more conservatively, but others had been planted in the zones where our more extreme weed control took place so it was interesting to see how these plants coped under the different conditions. 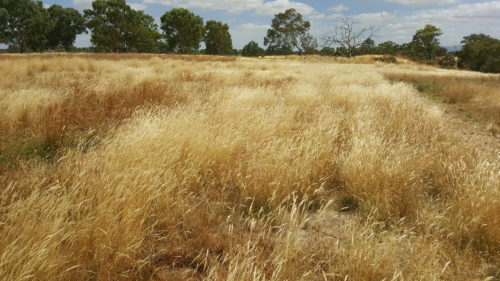 Because the exclusion plots contained most of the Dianella amoena and the best swards of Themeda triandra on the site, their weed control was limited and precluded burning, allowing the grasses to swamp the Dianella amoena and retard its growth. Plants outside the plots enjoyed almost no weed competition for two years and thrived. Figure 3. 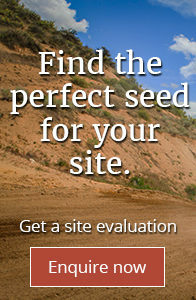 Cultivation is often an important component of our site preparation for sowing native grass seed. The zone 2 exclusion plot can be seen on the right. 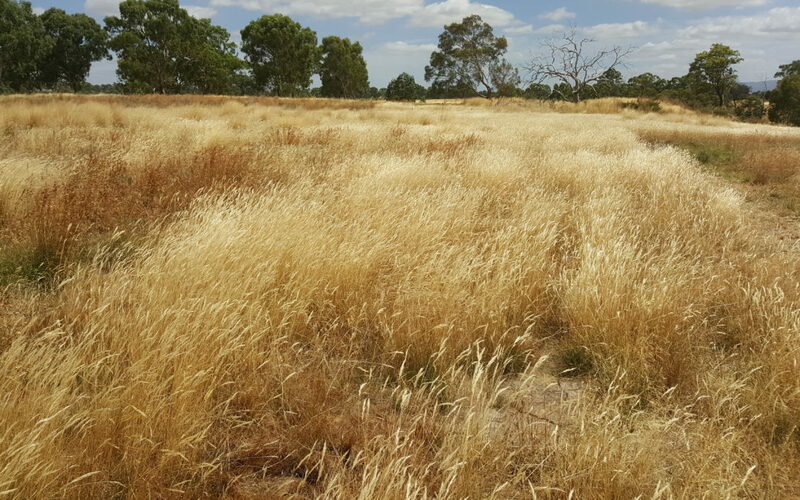 In October 2015 Themeda was sown in zone 1 and 4 and in March 2016 the Poa, Wallaby and Spear Grasses across the site. This gave us the longest possible period of time for preparation. In the winter/spring of 2016 Melbourne had extremely good rainfall making weed control a huge challenge. 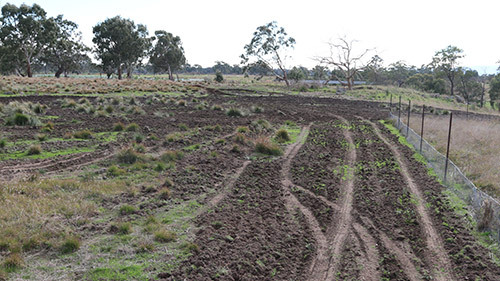 By the pre-handover meeting in early February the sown areas had filled out with native grasses, the exclusion fences had been removed from zone 2 and 7, and the site was looking like a different place. Figure 4. 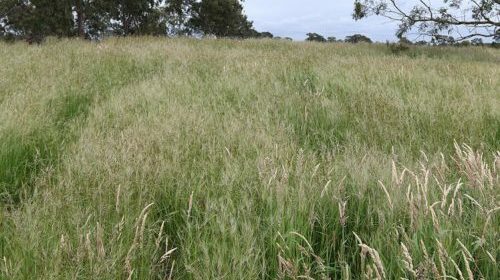 The same view as Figure 3 after the establishment of native grass. The Matted Flax Lily has thrived at receptor site 3. The next stage of the railway line is about to go ahead with more plants needing translocation. Hopefully this site will be used as a safe place for more of this endangered species in the future. Receptor Site 3 will be handed over to Parks Victoria in April 2017.